Bell's Olive Oil 200ml is for culinary use in salads and dressings, however it can prove quite beneficial for skin care too. Olive oil is rich in all kinds of nutrients, antioxidants, and vitamins, which are great for the body, whether you choose to consume it, or use it on your skin. Olive oil for culinary use in dressings and salads. 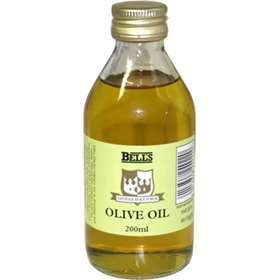 Bell's Olive Oil 200ml also complies with the requirements of B.P. 1973. Store in a cool dry place, away from direct sunlight.